Why should you keep your Pet's Health Record? If you have a dog or cat, you probably take care of its health. You read books and articles about pet's health, make vaccinations, feed it properly, properly equip its living place, walk with it on a fresh air, use the right shampoo, give it vitamins and other supplements. You also need to monitor the behavior of your pet day by day in order to notice an appearance of suspicious symptoms. And when you come to vet, you need to remember and tell him correctly what happened, how long ago it started, what measures have been taken, etc... The vet (especially if you come to him for the first time) will also ask you to provide various information about your pet: age, vaccinations, allergies, blood type, what diseases it had before, etc. Then, you have to remember everything that vet recommends to undertake and implement the treatment plan correctly. In general, taking care about a pet - is not a simple challenge. You have to learn a lot about your pet and use this information to make the decisions on which the pet's health depends. It's especially difficult for those who have several pets or is breeding animals. Fortunately, there are Pet Health Record apps which help to manage all this information and, in result, make better health-related decisions. These applications were inspired by Personal Health Record solutions that are used to take care about people's health. Pet Health Record software allows you to keep all important information about the health of your pet. First, it's an electronic medical card with the basic health data: date of birth, breed, color, blood type, allergies, vaccinations, medications (that are currently taken), previous diseases and information on pet insurance policies, identifying marks and license numbers. In case of emergency, you can quickly find this information and give it to vet. And when you go away from home, you can print out all the important pet health and contact information and give it to the pet sitter. Besides, pet health apps usually contain health journal, where you can record any information about what happens to your pet's health day by day - symptoms and diseases, visits to vet and examination results, taken medications and medical procedures. You can also track the various pet health indicators, such as weight, height, lab test results, etc. 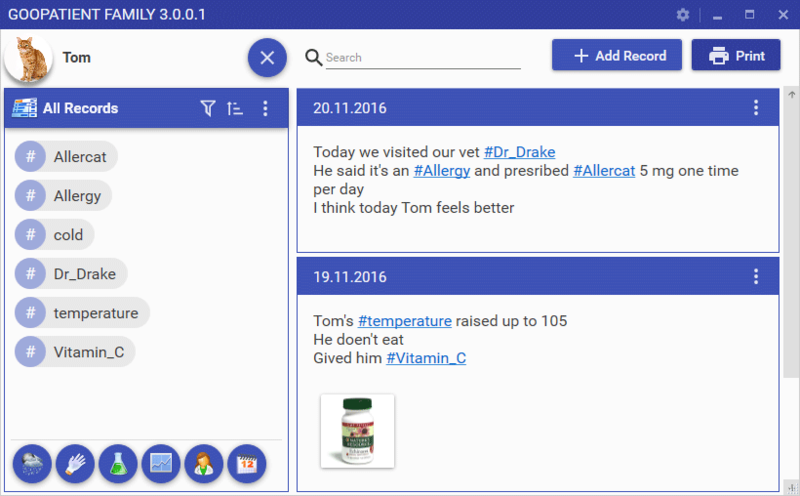 Pet Health Record apps can also be used to track money expences on pet's health, keep vet contact data, organize useful articles about animal health, store various medical files and photos of the pet. Why keep Pet Health Record in GooPatient? If you're smart enough to create health record for your pet, you of course thought about maintaining such records for your kids or parents, or at least for yourself. But why would you search and install another apps for that? 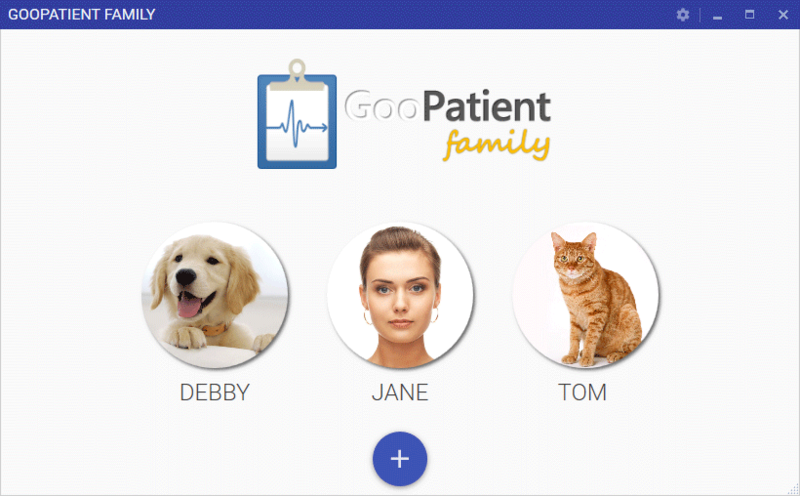 Fortunately, GooPatient - is so flexible that you can use it to keep health records for pets and for yourself and for your family. In GooPatient you can create multiple individual profiles with a separate medical cards, separate health journals with different categories and tags. All profiles can be password protected so that nobody could access them without your permission. The second advantage of GooPatient - is easy-of-use. Other applications require you to fill large and boring forms each time you want to record a symptom or medication or vaccine. In GooPatient you keep health records journal in the same way as you post to Twitter. You add a message in natural language and use hashtags to organize and sort records (like in Twitter). Goopatient also includes the mobile (Android) app that can be synced with desktop version via USB or cloud services. So you can take your pet medical data to the vet office. Finally, GooPatient allows to quickly take pictures with a webcam and attach them to records. You can also attach photos of your pet. Thus, the medical journal can function as a photo album, which shows how you pet is growing month by month.